On Monday, Dec. 19, you can grab yourself a slice of OTTO Pizza's award-winning pie for free at the 576 Congress Street, in Portland, Maine, from 2 p.m. to 6 p.m.
You may have heard the vicious, pernicious rumor — or as our Canadian friends to the north might put it, rumour — that Monday, Dec. 19 has been designated as a so-called “Free Slice Day” at OTTO Pizza. Monday, Dec. 19, is, in fact, Free Slice Day at OTTO Pizza’s shop at 576 Congress Street in Portland, Maine’s Arts District. The store will open at its regular time, 11 a.m., and close at about 1:30 p.m. so the employees can prepare themselves for the mayhem to come. At 2 p.m., the doors will be thrown open once again, whereupon Free Slice Day will be in full effect. From 2 p.m. to 6 p.m., anyone who stops in can pick up one free slice of OTTO Pizza’s award-winninng pizza, any variety, on the house. One to a customer, please — we’d like everyone who wants one to get one. OTTO employees who aren’t busily making more pie to keep the pizza flowing will be on hand and passing the hat to benefit local non-profit agencies. There might even be a few of our new, wicked cool t-shirts available, hot off the press … so get there early. 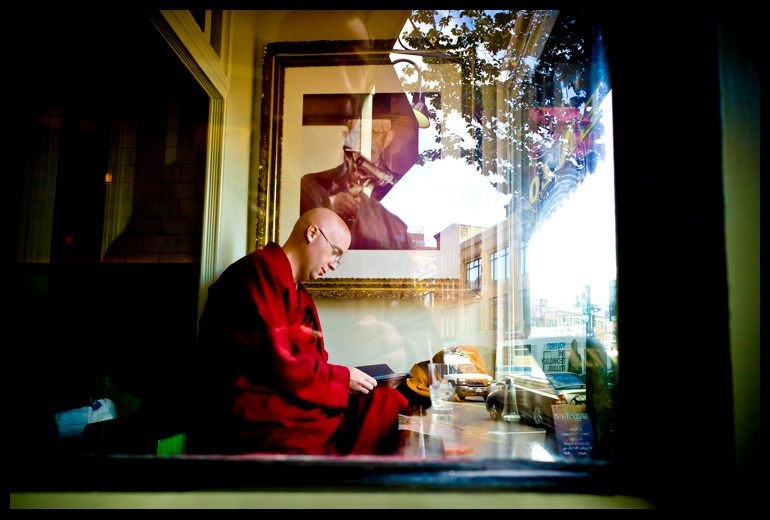 A Buddhist monk enjoys a slice of OTTO Pizza at the 576 Congress Street shop in Portland, Maine's Arts District. This entry was posted in Pizza, Portland Arts District and tagged arts district, bacon, cambridge, food network, harvard square, Maine, mango, mashed potato, massachusetts, OTTO Pizza, pepperoni, Pizza, Portland, pulled pork, scallion by elshepherd. Bookmark the permalink.